This Rose Promise Ring is about as simple as it gets. That is what makes it so beautiful. This is your standard Tiffany shank with a single rose sitting atop it. Nestled in the petals is a 3mm diamond. However, smaller or larger as well other stone types could be used. 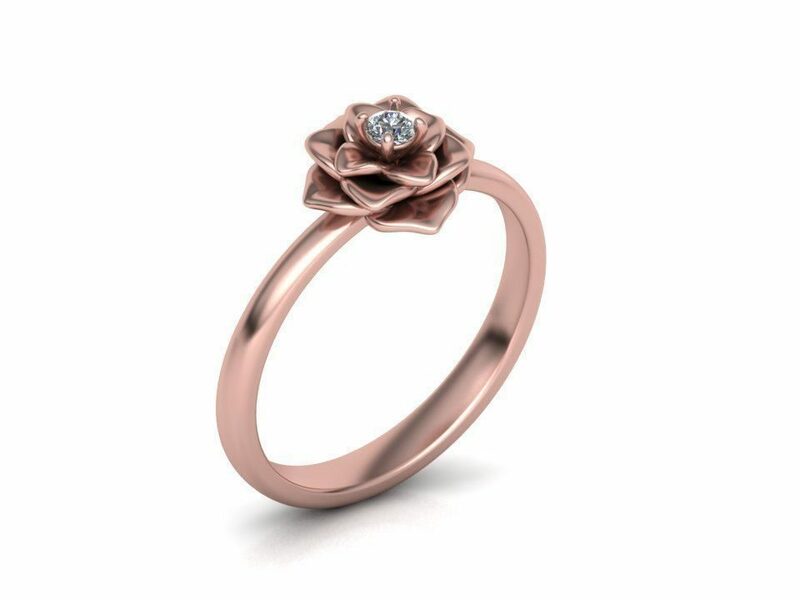 Are you are looking for a floral ring, but not a rose? Send us your idea and we will see what we can do. We would love to design your dream! The listed price is for a Silver Rose Promise Ring with CZ or a lab colored stone. Please contact us for alternate pricing options. Click HERE to see another Rose Promise Ring. Click HERE to learn more about custom engagement rings, to see more of our portfolio, or to contact us with your idea for a Rose Promise Ring. Why settle for the boring, mass-produced engagement rings you find at the chain stores when you can have your very own custom Rose Promise Ring made for less?